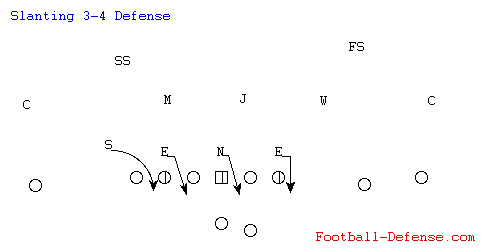 There are many good defensive schemes in football today. What is the best defense for your football team to use this season? Whatever you know best, or whatever fits your personnel best. Depends on who you are, how you operate, and what you believe. But maybe you need to make a change. 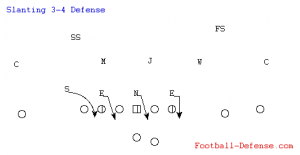 Will your defensive scheme still be a good one in the future? What defensive innovations will we see in the next ten years? Probably not many – there’s nothing new in football. But there’ll be adjustments, tweaks, and without a doubt, cool new nicknames for the same idea. Edit: This article is now 7 years old. Nothing has really changed. The ‘innovation’ of the last decade has been the RPO. 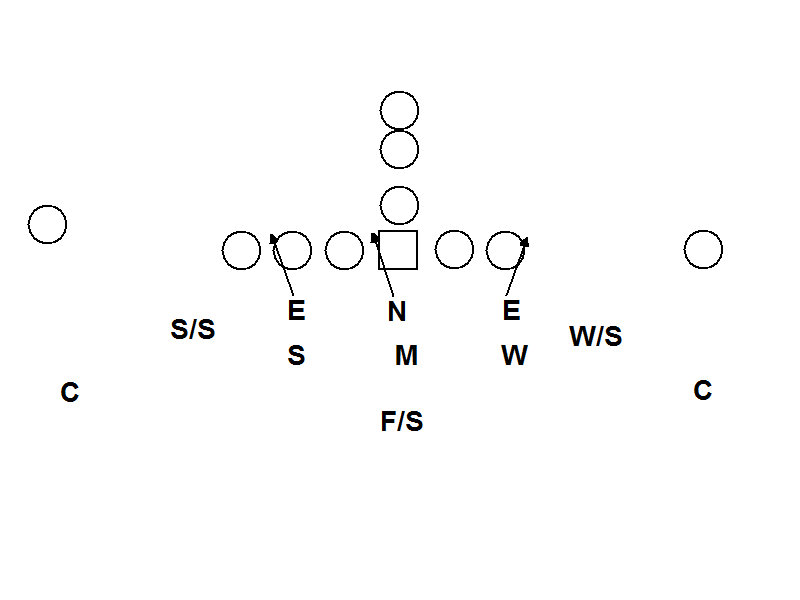 RPO’s are just like Triple Option in how you defend them. Any sound defense is capable of defending the Triple Option. I’m no expert on the true 46 Defense. I know enough to know that it is not a 4-6 Defense. 46 was the number of Doug Plank – I had to double check that with the 46 Bear Wikipedia Article. What I consider to be a bear front is anything with two 3-Technique Defensive Tackles and a head up Nose Guard. At least, that is the simplest way to identify the front. The Bear Defense relies on Man Coverage most of the time. It is a great run-stopping front. No question. Not a big time Man Cover guy? You may not be excited about running this. The true Buddy Ryan-created Bear Front also does some funky things with the backers and Strong Safety that I’m not going to get into, here. A great resource is Rex Ryan’s book, Coaching The 46 Defense. Even if you don’t coach the 46 Defense, you need this book. The chapter on Defensive Line is the single best resource on coaching that position I’ve ever run across. It’s a great defense, but you don’t see many teams running this as their base defense. We do see it (and use it) as a change-up front quite a bit though. The 3-4 Defense has been making a comeback in our area over the last 5 years. It’s the same as a 5-2 Defense, giving more flexibility to the Outside Backers. The defense is centered around 3 down linemen – normally a head up Nose Guard and two head up Defensive Ends over top of the Tackles (4-tech). There are two middle Linebackers, usually over the Guards. Finally, the front features two Outside Linebackers. These guys are going to be more athletic than the old stand-up 5-2 Defensive Ends. They are the natural fit for being contain-responsible, as well as handling the flats in pass coverage. This is a good fit for a Quarters / Cover 4 coverage package. That’s a good match to today’s Spread Offenses because you’ve got a lot of speed on the field. There’s multiple different variations on the 3-4 Defense. I covered some of the basics in this podcast. Modern defenses need to get the maximum number of athletes on the field, and be completely adaptable. The 3-4 Defense fits the bill, so we’ll put it at #4 best defensive scheme. The greatest defense there is, in my opinion. The 4-man front is the way to go, in my opinion. And the 4-man front of the 4-3 Over/Under Front is awesome. You really need one true Defensive Lineman, the 3-Technique strong side Tackle in the Over Front. On the weak side, you can play another DT if you’ve got him, or a wrestler-type kid at the 1-tech Nose, a weak shade on the Center. The ends are aligned outside shade of the end man on the line, either an Offensive Tackle or a Tight End. They’re crashing hard, spilling everything to the outside, rushing the passer, and causing havoc. These guys are linebackers, freakishly fast for the defensive line. The other linebacker-type on the field is in the middle, at the Mike Backer. He’s over top of the Nose Guard, two-gapping the weak side B-Gap and the strong side A-Gap. The strong and weak backers are more like Strong Safeties, that hybrid position everyone loves. One is probably more of a backer than the other. They, along with the two-deep safeties, make this defense so adaptable. Any coverage, any time. Any blitz, any time. You can do it all. Yes, I love the 4-3 Defense. I understand it better than anything else and can adapt it however it needs to be adapted. It works great with any coverage, but most importantly Quarters. 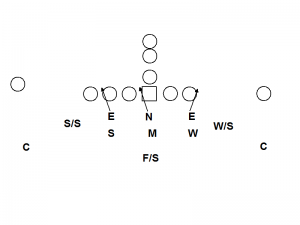 There are several different variations of the 4-3 Defense. When I’m talking 4-3 Defense, I’m referring to The Miami 4-3 Defense. I still feel you can get more speed on the field in a 4-3 Defense (or 4-2-5) than you can with a 3-man front, because of the way the Ends play. But I put it at #3 because this isn’t about me, it’s about football. And while there may still be more teams running the 4-3 today, there are a couple of other defenses that are gaining popularity much more quickly. 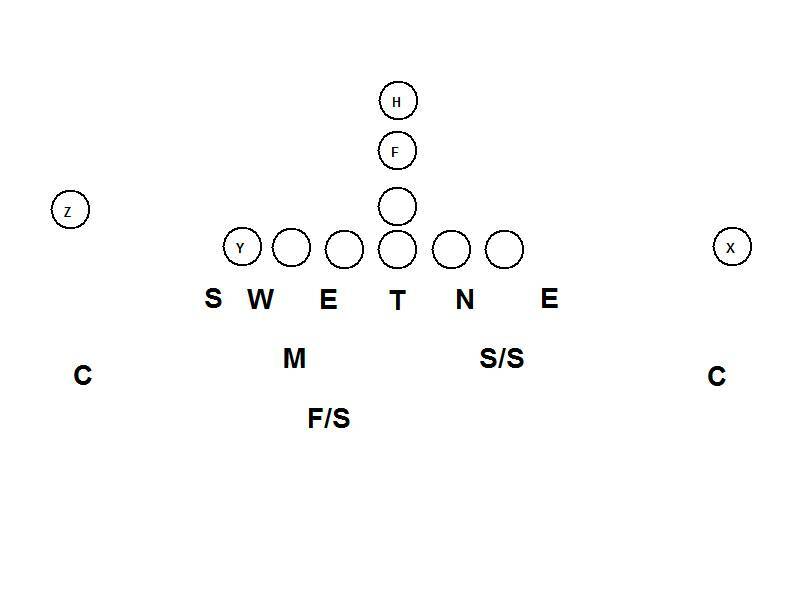 For today’s Spread Offenses that are putting so many speed threats on the field, the 3-5-3 (or the 3-3-5, same thing) is a great way to answer. Whenever someone is looking for the best defense to run with their undersized defense, they seem to always turn to the 3-5-3. Just like the 3-4 Defense, you’ve got a head up Nose Guard, and two guys lined up head up on the OTs, usually called Ends. 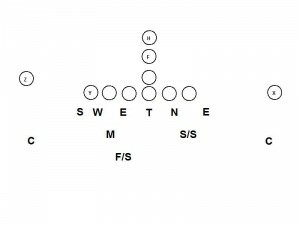 The defense is also called the “Odd Stack” because of the alignment of the Linebackers – 3 of them, directly behind the Defensive Linemen, or stacked. The two outside backers, or overhangs, are going to be (roughly) 3 yards deep and 3 yards outside the end man on the line of scrimmage. They’re the contain guys. And responsible for the flats – the natural fit, once again. 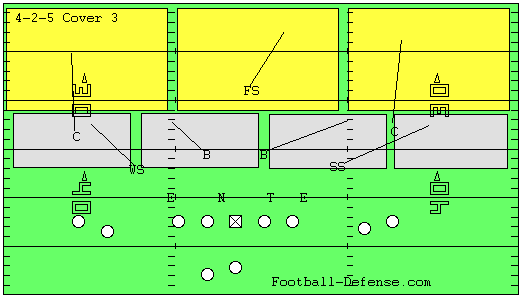 The limitation of the 3-5-3 Defense is that it really fits with Cover 3, and running it with Cover 4 or Cover 2 is more difficult than doing it with the 3-4 Defense (or the 4-3). It can be done and lots of folks do it, but it isn’t the natural fit. The advantage is that you can bring blitzes from all over the place. Most teams running the 3-5-3 are blitzing on every play – at least bringing one guy. Those who know what they’re doing don’t just blitz at random, either. They’re creating fronts. With a combination of slants on the defensive line, and blitzing backers, you can create almost any of the other defensive line fronts under the sun – but do it all from the same initial alignment. The masters of the 3-5-3 are playing the ultimate head game with the offensive coordinator. If I had to pick one of these defensive schemes from scratch tomorrow, train some assistants, teach the kids, and have them going in a week – this is what I’m going to run. There’s nothing simpler, and nothing more effective. You’ve got the advantages of the 4 down linemen, with the ability to plug in those faster defensive ends mentioned in the 4-3. In fact, I wrote about installing the 4-4 Defense in less than 30 minute. Read it here. You’ve got the advantages of the 4 down linemen, with the ability to plug in those faster defensive ends mentioned in the 4-3 Defense. The responsibilities for the backers are simpler. The overhangs (if you want to call it a 4-4, call your overhangs Linebackers instead of Safeties) have contain responsibility, and cover the flats. Plus you’ve got a Free Safety screaming downhill on outside runs. 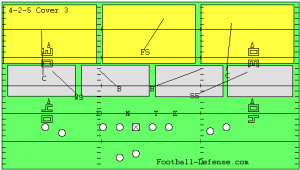 The only difference between the 4-2-5 and the 4-3 defensive schemes is that the strong side Defensive End will play head up or shaded inside against a Tight End, handling the C-Gap, as opposed to crashing from the outside of the Tight End. Otherwise, you’ve got your athletic weak side End, crashing hard on the play. You need one true Defensive Lineman, your strong-side 3-Technique. Your other Defensive Tackle that can be a smaller and quicker guy, playing the weak shaded nose. The backers are aligned 5 yards off the ball, outside shade of the Guards, playing the open gap to their side. Everyone plays one gap. That’s different from the 2-gap Linebackers in the Miami 4-3 Defense. That 6-man box is solid. Alignment doesn’t have to change against many offensive formations. The coverage in the 4-2-5 Defense is the same as the 3-5-3 Defense. 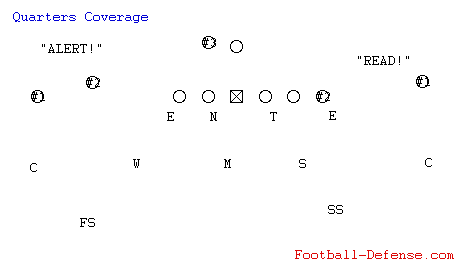 Its not impossible to run a 2-high coverage, but the natural fit is the Cover 3. For a better understanding of Coverages and Fronts, listen to this podcast on the only 4 defenses in football. The blitz angles aren’t as good as they are with the 3-5-3, but the presence of a consistent 4-man front lends itself to better run stopping ability. In theory, anyway. Most teams are going to face everything from Spread Offensive attacks, to Wing-T, Double Wing, I-Formation and anything else. The 4-2-5 Defense is easy to adapt to all of these. And that 6-man box never has to change a bit. You can use a wide variety of blitzes. And whatever Coverage package fits your needs. Simple for your guys, complex for the opponent, and adaptable to anybody… the #1 Defense in Football today is the 4-2-5 Defense. Want to learn more about the 4-2-5 Defense System? Check out my exclusive Video Series on Foundations of The 4-2-5 Defense. Click here to learn more about it. 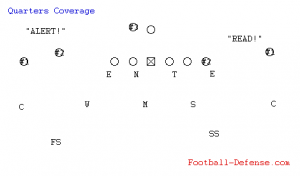 5-2 Monster Defense – Who still runs this? I don’t know. But they’re out there. After all, its not that different from the 3-4, so you can adapt it. I like the “Monster” part. Double Eagle Flex – Who runs this? I don’t know that either. But it’s interesting and Coaching Football’s Double Eagle Flex Defense is worth a read. If nothing else, you’ll get some good ideas for adjusting your defense.